I'm launching machinarium on a machine with win7 pro 64bit, gtx 760 and chrome with flash 13. The game start and executes the logo animation but then I only get the bottom menu and a totally black screen. The hardware acceleration option turns on every time I close the flash settings panel. What can I do? Re: Machinarium black screen after main logo animation? Phil's solution (reply #2) might be applicable for you?? acctually I've tried to change settings about DPI, resolution, windows desktop theme/composition, user permissions, steam overlay, compatibility options; I've tied to install different flash version (for chrome and explorer), shockwave, browser and plugin. Furthermore, I'm not able to disable "hardware acceleration" checkbox. Phil's solution to his problem was to change the font size. Have you tried to change that? Good news - after two hours of frustration trying a hundred different things, I have finally solved my problem. The problem is the Windows 7 font size. If I set it to "Smaller (100%) default" (Control Panel/Display) AND disable Flash hardware acceleration, the game scales correctly to my screen area and works properly. With font size set at "Larger (150%)", it doesn't work. ATTENTION AMANITA - in the installation advice where you tell people to disable hardware acceleration, please also add to set Windows font size to 100% too. This will avoid other people wasting an evening like I did. • close Windows Explorer, then try to disable hardware acceleration again. Maybe changing the font size will allow you to disable hardware acceleration?? Have you tried the steps I found on Adobe's site (which is in my previous post at the bottom there)? Which keywords have you searched? Can you link me the original post, even in private? And I googled "can't disable hardware acceleration flash" *without* the quotes. Well, was so simple... By the way, I'll post the solution on steam's forum. Thank you again. By the way, I'll post the solution on steam's forum. I have this problem on macbook pro with yosemite. Just to clarify, can you uncheck the checkbox which says "Enable hardware acceleration"? If you can uncheck it, is it checked again once the Settings dialog comes back up? It checked again once the setting dialog come back up. If that doesn't solve the issue, the next thing I would suggest is to delete all local storage, saved choices, settings, and other data used by content in Flash Player across all browsers on your computer. 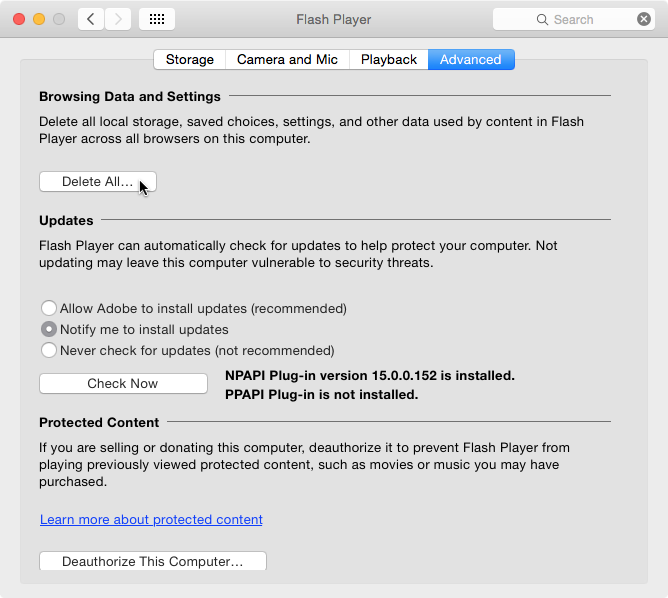 In System Preferences, choose Flash Player and click the "Delete All..." button. Run the application and choose the Integrated Only option.